India is endowed with a diverse landscape and varied climatic conditions. Of course, a wannabe visitor would find April high in humidity, reeling under a moderate heat wave; but would be pleasantly surprised at the relatively cooler climate in Northeast and seaside area down South. But if one takes on a mood to delve deep into India’s rich culture, cuisines, flora, fauna, and travel to the dusty yet colourful interior, April would prove to be an excellent month. April is heady with the aroma of traditional-regional New Year festivities, cultural and religious fairs and festivals. The 3 -day Mewar festival is usually held in the month of March / April in Udaipur with zest and dedication. Mewar or Mewāḍ is an expanse land in south-central Rajasthan state in western India. Bhilwara, Chittorgarh, Rajsamand, Udaipur, Pirawa Tehsil of Jhalawar District of Rajasthan, Neemuch, and Mandsaur of Madhya Pradesh and some parts of Gujarat form Mewar region. Udaipur is an important city in terms of heritage, culture and Rajput history. Mewar Spring festival was initiated during the reign of Sisodia dynasty. It has religious as well as all the features to highlight the cultural heritage of the Mewar region. The festival is a laudable effort at protecting the cultural and historic importance of Udaipur and predominantly of Mewar region. This festival coincides with another religious festival namely Gangaur festival of Udaipur. 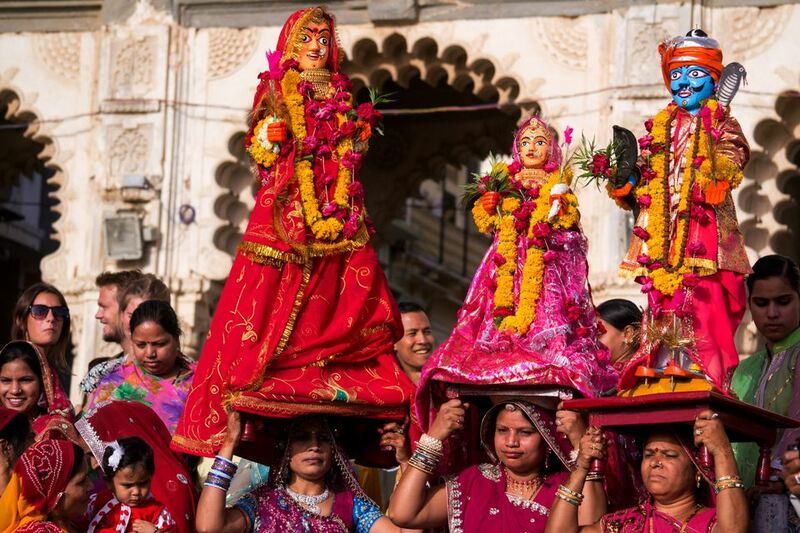 The festival day sees colourfully attired Rajasthani womenfolk decking up idols of Goddess Parvati and Lord Shiva and taking the deities to the Gangaur ghat Pichola Lake in a grand procession. The ambience fills with the traditional songs tinged with devotion for the Gods. Having reached the lakeside deities are taken into boats and immersed in the middle of the lake. The sight of hundreds of such boats gliding on the lake is a mesmeric spectacle. Songs, dances, firework, and cultural performances are other main attractions and people participate with all gusto and cheerfulness. This festival is a notable and one of the biggest music festivals of Rajasthan. Usually a three-day festival, this event is very different from all other music festivals. The concept is grounded on preserving and showcasing the rich flavour Rajasthani folk music and dance with its entire splendour. Talking about Rajasthani folk music it’s worthwhile to dig a bit into the cultural lifestyles of nomadic Rajasthani gipsies and such other wandering tribes of northern India. The gipsy tribe of Rajasthan has been there since centuries leading a vagabond life. They belong to lower strata of the socio-economic ladder and thrive on giving live performances of music, song and dance to members of royal families on festive occasions. Their other modes of livelihood include acrobatic performances, snake charmers, hunting, basket makers, storytellers, and earning from livestock. Some notable tribes are Gadia Lohar, Maldhari, Bhutia, Bhils, Raika, Koli and many more. With the decline of Royal families after India’s Independence from the colonial power, these tribes fall into the abyss of dismal poverty and their traditions groomed through ages suffered too. One cannot take eyes of such beautiful tribal theatrical and dance forms like Matka Bhavai, Nautanki (Uttar Pradesh), Kabelia, Ghoomar, Gair, Chari, Kacchi Godi, Tera Taali, Kathputuli, Fire dance, Gawari, Jhoria, Dhol nritya etc. Many nomadic tribes have become extinct and some struggling to keep their culture intact against waves of modernity. Some tribes like Bopa and Kalbeliya, for example, have many a colourful dance form and music popular the world over. The sensuous swirling movements of women dancers of such nomadic tribes are mesmerizing. The gipsy men are talented folk musicians. Dholak, pungi, been, khanjari, morchang, and khuralio are some musical instruments played with zeal and expertise. The UNESCO in 2010 has incorporated the folk songs and dance forms of Rajasthan from the Bopa and the Kalbeliya into its Intangible Heritage List. Flamenco & Gypsy Festival held annually on the ramparts of Mehrangarh Fort in Jodhpur is a praiseworthy platform at recognizing such talented dancers and singers. The festival also aims at giving nomadic tribal culture of other regions of the world a chance to perform and mingle with the local tribal crowd. To be more precise Flamenco is a cultural performance based on various folkloric music of southern Spain. The Flamenco & Gypsy Festival was originally intended at bridging the Spanish and Rajasthani folklore culture in one platform. With the growing popularity of the festival, other folkloric culture from other parts of the world participated. Previous editions of Flamenco & Gypsy Festival have seen electrifying performances of Spanish flamencos with Rajasthani tribal folklore. The event has been attracting a number of tourists from national and international destinations and 2019 expects to see a growth in numbers. Gangaur is a socio-religious festival fervently celebrated in Rajasthan. The calendar date for the Gangaur festivity is around March/ April but usually, it comes after Holi and at the commencement of Chaitra month. The rituals embedded in the observation of the festivals extend for about 18 days. Though a state-wide festival, it is most notable in places like Jaipur, Udaipur, Jodhpur, Jaisalmer, Bikaner, and Nathdwara. The name “Gangaur” itself bears a religious significance as “Gana” means Lord Shiva and “Gaur” means Goddess Parbati otherwise known as Gauri. Ganagaur festival is the worship of Shiva and his consort Parbati by married as well as unmarried women. It is a celebration of love and marriage. Parbati, the symbol of purity and austerity and the ideal consort of Lord Shiva is mainly revered on this occasion by women for her blessings in their marital journey. While married women worship Parbati for health and longevity of their husbands, unmarried women pray for a good husband like Lord Shiva. As per mythology, Goddess Parbati, after her marriage to Lord Shiva set foot on her parental home for the first time on the day of Gangaur. On the last day of Gangaur she was given a grand farewell by her loved ones and she returned back to her marital home. Most probably Gangaur festival is observed to mark the returning Parbati to her parental home. A visitor to Rajasthan would see beautifully crafted clay or wooden idols of Lord Shiva and Goddess Parbati are again decked up in fine clothes, ornaments and set on a pedestal at home. The divine idols are worshipped with flowers and wheat grass. Water pots are painted in traditional Rajasthani maandna. Married and unmarried women observe fast for the entire festival period and on 7th day young maidens are seen carrying ghudilas(clay pots) with a lamp burning inside them on their heads. All the while the atmosphere is joyous with girls singing customary Rajasthani songs. Sinjara is the second last day of the festival. It is a ritual for the parents of married women to gift their daughters with sweets, clothes, and jewellery. A visitor would be elated to see hands decorated with beautiful patterns in Mehendi. The colourful celebration of “Gangaur” reaches its crescendo on the last day. The day marks the return of Goddess Parbati to her marital home. Ghudilias are broken and bejewelled idols of deities are taken in a traditional procession with much pomp and pageantry. The mesmeric sight of Rajasthani women dressed in traditional attires and singing with brass pot perched atop their head is exhilarating. The festival culminates in immersing the idols in a nearby lake or pond. In Udaipur, a specifically named ghat called Ganguar or Gangori ghat on Lake Pichola adorns a festive look on the final day of Gangaur. A grand procession of idols starts from city palace. The procession is headed by singing women, elephant procession, old palanquins, chariots, and bullock carts. Exquisitely decorated procession of boats on the lake Pichola and accompanied fireworks are highlights of the day. Gangaur festival coincides with Mewar Festival. Cultural programs and folk performances are an integral part these days. Gangaur festivities in Jaipur is also famous the world over. The usual ritual of worshipping, fasting for 18 days, followed by a grand procession ceremony to immerse the idols is observed. A special sweet delicacy Ghewar is prepared, partaken and distributed amongst friends and relatives. The festivals days are marked by cultural actions in Jaisalmer like folk performances, fancy dress competitions, processions, traditional music fiesta. Rituals and processions are quite similar to the other regions of the state. This festival is called as Dhinga Gavar in Jodhpur. Instead of Lord Gauri, the locals worship a form of Shakti, Dhinga Gavar. In this festival, the locals worship either clay or wooden statues and the celebration extends for just 16 days. On the final day, a procession takes place through the main markets and public areas, as the locals assemble to worship the deity. Grand celebrations take place at specific locations. Statues of the goddess are decorated with kilograms of gold and dry fruit powder is served to the deity. Fancy dress competitions, folk dance and music performances and others will be conducted. Pushkarna Brahmin families’ married women beat unmarried men with a stick, as a form of blessing for a happy married life in the future. Gangaur is also celebrated with as much fanfare and associated customs and rituals in Agra. The festival runs for two days. A mela or Fair is organized and Ganagur is taken out on a procession to the beats of band music. Beautifully attired women march with the idols. The Gangaur celebration in Agra is a bit different from Rajasthani observation of Gangaur. The festival in Agra sees the immolation of an idol of demon Bhasmasur with much pomp. The tradition of immolating Bhasmasur has been there for centuries. Spring in Kashmir is at its scenic best and is the season of Tulips, the perennial herbaceous flowers. A unique festival celebrating the colour of the flower of the season is organized at Indira Gandhi Memorial Tulip Garden, Srinagar, Kashmir. The garden is cradled in the gentle slopes of Zabarwan range, overlooking Dal Lake. The Garden is the largest Tulip garden in Asia, stretching 30 hectares. Hyacinths, daffodils, ranunculus are other kinds of flowers in the Garden. As one takes in the enthralling sight of a billion multi-coloured Tulip blooms at the garden, the two-week festival also had many other highlights to arrest one’s attention. The view of numerous parallel rows of variously shaped red, orange, yellow, purple and mauve tulips is riveting. A dose of cultural programs, Kashmir folk songs, dance, the sale of Kashmiri handicrafts, Kashmiri cuisines is in offing during the week-long show. Aoling festival is an authentic annual spring festival exclusively observed by Konyak tribe of Nagaland. It marks the end of sowing season and the beginning of ‘Jhum’ cultivation. Nagaland has a whopping number of tribes and each one has its own season and religious festival. Konyaks are one of the 17 officially recognized tribes of Nagaland. They are quite well-known for a bizarre practice of head-hunting. This tribal group is found in Mon region of Nagaland and in Myanmar. They are distinctly recognizable from other tribes because of pierced ears, nose and tattoos all over their body. Once a dreaded group of headhunters Konyak tribe has been now leading a quiet and peaceful life. The week-long tribal New Year celebration involving dancing, feasting, and sacrifices has each day designated for a particular ritual. The first three days of the festival are called Hoi Lah Nyih, Yin Mok Pho Nyih, and Mok Shek Nyih. These days are mainly spent in preparation. Rice beer is prepared, traditional clothes are weaved, animals are collected for the purpose of sacrifice etc. The fourth day known as Lingnyu Nyih is the day to dress in traditional clothes head gears and jewelry, dance, sing and eating ethnic cuisines. Lingha Nyih and Lingshan Nyih are the last two days respectively. The days are spent in visiting relatives and cleaning the village. The season sees the bloom of red Coral tree flowers and red lilies. The flowers are also mentioned in the traditional songs of the Konyaks. Longte Yullo is a spring-time agriculturally significant festival celebrated by Nyishis tribe spread over five districts of Arunachal Pradesh. The festival marks the onset of sowing seeds in cultivated fields. Nyishis tribe celebrates three festivals like Nyokum, Boori-Yullo and Longte Yullo is one of them. The festivals of Nyishis tribe centres around variety ancestral deities who the think influence their life from womb to tomb. They propitiate these Gods and Goddesses by observing festivals and rituals individually and collectively by sacrificing domesticated animals and offering ginger(takki), rice powder (attang), fowls feathers (rugmh),paddy (amchuk) etc. But Longte Yullo festival is unique and distinct in many ways from other harvest festivals of Arunachal Pradesh. This festival has no ritual or animal sacrifice. People observe certain formalities like no one can cross the fence after it is erected, not to cut trees or grass. Longte-Yullo means a large wooden barricade/fence. The fence is erected on a community basis in the belief that this separates the province of humans and spirits from malicious trespassers like diseases, bad luck etc. This festival is usually celebrated in the month of April (Lachar-Polu). The Longte-Yullo has an interesting mythological tale woven around mythical Abu Tain/Abotani and his several wives. During Longte-Yullo period, these days traditional dance, songs are done by people dressed in best tribal customary attire. Unakoti is a major tourist spot of Unakoti district of Tripura. The major attraction of the place is the ancient Shiva temple housing 30 ft high Unkotiswara Kala Bhairav head and the shrine dates back to the 7th or 8th century. The place is also famous for huge rock-cut or largest bas relief images or sculptures of various Hindu Gods and Goddess. Unakoti is not only a holy place but it is a beautiful location steeped in nature’s bounty in the form of lush greenery and scenic waterfalls, thus making it an ideal hill-station too. Sitakunda or Ashtamikunda, a natural reservoir of crystal water formed from a spring is another tourist pulling factor during Magha Sankrnati (February) and Ashokastami. Ashokastami festival is celebrated in the month of Chaitra and it is associated with religious beliefs of various tribes of Tripura. But non-tribals also participate in the festival. People from nearby states also congregate at Unakoti to take a holy dip in Sitakunda. Special worships and grand celebrations are held for the deities engraved on the hill rocks of Unakoti. 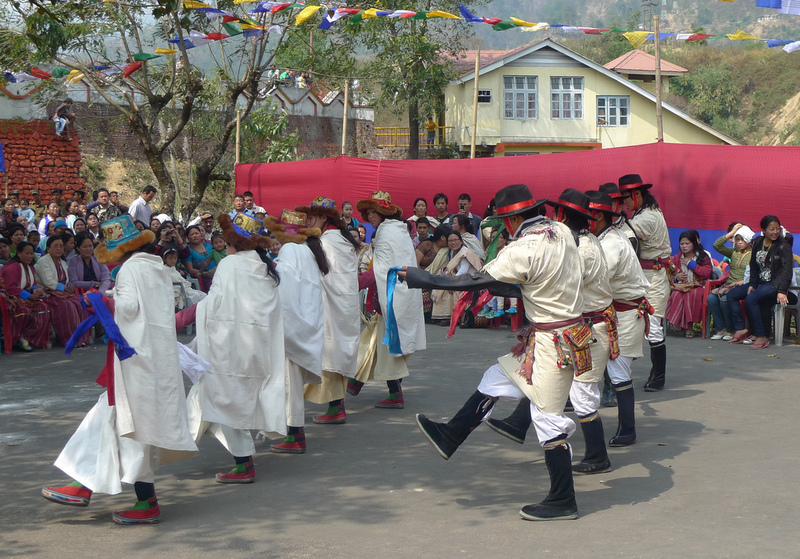 Mopin festival is one of several authentic tribal celebrations observed exclusively by Galo tribe of Arunachal Pradesh. Amongst a large chunk of tribes, Galo tribe is another major tribe of Tribal dense Arunachal Pradesh. The Galo tribe has been listed as a scheduled tribe in the Indian Constitution. They appear by the name of Galong in the scheduled tribe list. Recently the Galo community has been successful in naming it as Galo. These eastern Himalayan tribal groups inhabit east and West Siang districts of Arunachal Pradesh. They are predominantly an agrarian community and practice shifting cultivation along with wet rice, terraced and Jhum cultivation. Pigs and poultry along with weaving baskets and clothes provide other sources of income. It’s interesting to mingle with Galo community and get an immediate idea about their attire, specially designed wooden houses, excellent woven bamboo baskets, cuisine and of course festivals. 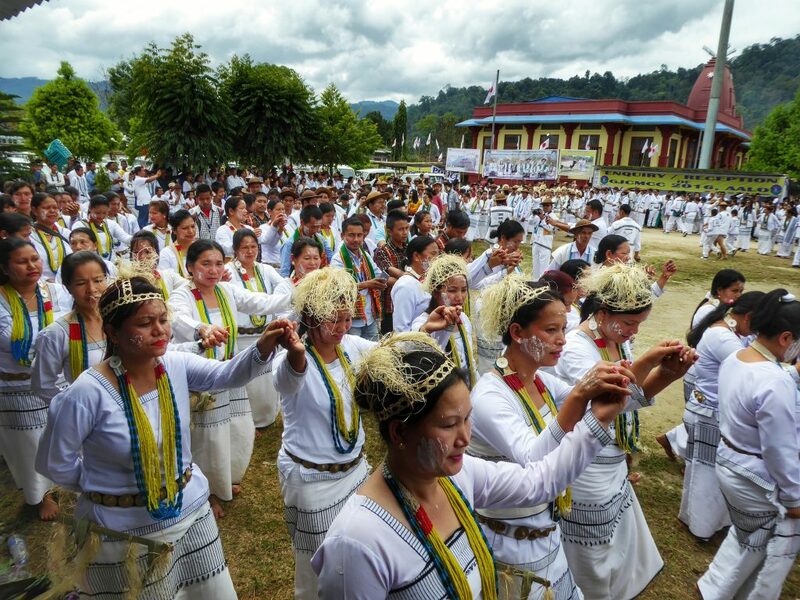 As with every tribe in Arunachal Pradesh, Galo tribe too is known for its distinct culture and celebrates myriad festivals throughout the year. But Mopin festival is significant from the point of view of socio-religious aspect. The Mopin celebration is a sort of New Year celebration and is meant to ward off evil and bad luck and shield the community from any natural calamity. Usually celebrated in Lumi or April every year, the festival aims to ushers in prosperity, gaiety, health and wealth. White is the dominant colour of the festival. Men wear white embroidered white jackets and women looked surreal in white galas( skirts). The presiding deity for the occasion is Goddess Mopin Ane and is worshipped with all rituals prescribed for the festival. Galo men and women dressed in multi-coloured attires, bead ornaments, swoon in trance-like dances with mist drenched hills on the backdrop. A mass sacrifice of four mithuns,(a wild creature like buffalo), pigs, chicken, birds, sometimes a dog take place to appease sun and the moon. The night before the animal sacrifice the village resonates with the chanting of “shamans” to calm the spirit of animals meant for sacrifice the next day. Visitors to any Galo dominated region during Mopin festivity would relish Apong or Poka ( a type of rice beer) in a bamboo cup. A variety of ethnic dishes churned for the occasion are dishes made of rice, slices of meats from the sacrificial animals like mithun, bamboo shoots, and boiled mustard leaves. People rejoice by smearing rice powder(Ette) on each other’s face. Popin is a traditional dance performed on the occasion. Besides, young and old alike engage in dancing, singing, feasting and dancing. Sangken is another socio-religious festival of Arunachal Pradesh celebrated to usher in New Year. It is also known as traditional water festival, as one has to undergo a sort of purification before stepping into New Year. Though widely celebrated across Arunachal, this festival is also seen observed in some parts of Assam. Arunachal Pradesh is one of the best places in India to witness interesting customs and rituals of a varied number of old indigenous tribal groups. Sangken festival is also a tribal customary celebration and is predominantly observed by the tribal group, Khampti race of Lohit district. This group follows Theravada Buddhism. However currently, the festival is not confined only to Buddhists but is celebrated by all the natives of the states as well. ‘Sangken’ has of late come to signify secularity, brotherhood, following the teaching of Buddha to some extent and of foregoing hatred, enmity and starting a new relationship. Sangken is usually observed in 'Nuean Ha', or fifth month of the year of the Khamti Lunar calendar coinciding with the month of April. Celebrations start on the last days of the old year. It goes on for three days. The Lunar New Year begins on the day just after the end of the ritualistic festivity. Sangken is also observed by Tangsa, Singpho, Tai Khamyang tribal groups. Visitors to the ‘Land of Golden Pagoda’ on the month of April would be surely struck by the magnificence, warmth, and devotion that are displayed while observing this grand New Year ritual. The celebration days see customary bathing rite of Buddha images inside specially constructed temporary shrine called 'Kyongfra’. The scented bath water is considered holy and is distributed amongst the devotees. Thereafter the divine bronze idols are taken out on a procession. A line of persons, each carrying statues marches on to the accompaniment of drums, gongs, dances and of course crowds singing songs in respect of the holy God. On the last leg of the festival, the idols are taken out of ‘'Kyongfra’ and re-installed on the original shrines (viharas). A community feast marks the commencement of New Year. The festival period also sees general gaiety everywhere and people are seen splashing buckets of water on each other. During the festival, people observed some kind of austerity like abstaining from killing animals, drinking alcohol, sexual activities. Even they take a break from manual work like cutting trees etc. The festival is delightful as an assortment of exotic delicacies and many variations of the same dish satisfy the taste buds of guests. Steamed fragrant rice called khau-tek, cakes made of grounded rice known as khaomun-sen, are some popular tribal cuisine. Others include Khawlam (boiled rice in bamboo), Khaopuk (made of sticky rice and sesame seeds), and Khaomun-tong-tek. Interestingly, Gudi Padwa is celebrated in other regions of India through the name varies. For e.g. It is Samvatsar Padvo amongst Konkani Hindus in Goa and Kerala. The agrarian festival marks the reaping of Rabi crops. The festival has many mythological background story that adds to its charm and meaning to the rituals adhered. While the festival is linked to the mythical day when one of the Hindu trinity Bhrama created universe and time, some attribute the celebration to the coronation of Ramachandra after his victory over Ravana. Still, others say on this day great mathematician Aryabhatta wrote Panchanga (Hindu calendar) and also to the legend of Satavahana king Shalivahana. The festival is not linked to worship of any particular Hindu deity, but people clean their house precincts with cow dung, draw intricate Rangoli patterns and wear new clothes. A Prasad made of neem and jaggery along-with shrikhand, poori, puran poli, kothimbir badhi, fried modak, shankarpali, aam pana are some of the mouth-watering recipes prepared in every Marathi household to welcome the New Year. One could sight ‘Gudi’ in the front yard of almost every Maharashtrian household. Gudi is a colourful silk scarf tied to the top of a bamboo pole and some neem boughs, mango leaves, flower garlands adorn it. Then all these are capped with a silver, bronze or copper pot (handi or kalash) signifying victory and to ward off evil, and invite good luck to the house. The word ‘Bihu’ is synonymous with the state of Assam. Bihu is actually celebrated in three various names and at different times of the year. Bihu is an agrarian festival; the other three parts are Rongali Bihu, Kaati Bihu, and Magh Bihu. On the month of April, Assamese observe Rongali Bihu or Bohag Bihu is observed. This is also popularly known as Assamese New Year. On the first day of Rongali Bihu( Goru Bihu), cattle are given a bath worshipped. The next day people wear new clothes and observed Manua Bihu or New year. On the third and last day i.e Gosai Bihu they pray God for a year of happiness and prosperity. Dance, song, community feasts mark the occasion of Rongali Bihu. Rituals like hanging things made of bronze, or silver on a pillar in the front of the house are seen. Children are decked up with flower garlands and march on a procession. Bihu dance is performed on these days. As per Hakacham, the modern form Bihu dance first started in Hari Dewalohi temple. The Ugadi festivals like other Hindu religious festivals have an interesting story behind its origin. It is believed Brahma created the universe and ‘yugas’ on this day after He got back the ‘Vedas’ which were stolen by a demon named ‘Somasura’. The ‘Vedas’ were later rescued by Vishnu who took Macha Avathar ( one of the 10 incarnations of Lord Vishnu) and returned to Brahma. People start preparing for the auspicious occasion in advance. The ritual or custom like house cleaning, buying new clothes, collecting ingredients for special festival delicacies are almost the same as observed in other traditional New Year festival. On the day of Ugadi people woke up before sunrise and take a bath after massaging the body with sesame oil and offer a prayer in temples thereafter. The entrance of every household cleaned with cow dung. Mango leaves are hung above the front door top and intricate Rangoli designs are made on the ground. Religious zeal, merriment, family get-together, and an optimistic mood to start new ventures mark the Ugadi occasion. Special dishes are prepared to be offered to God. In Andhra Pradesh and Telangana Pulihora(a tangy, spicy rice dish), New Year Burelu, bobbatlu (Bhakshalu) and Pachadi( Chutney). Pachadi is the most important dish and it is prepared with tamarind paste, neem flowers, brown sugar or sweet jaggery, salt, and raw mango. It thus is a concoction of sweet, sour and tangy and is symbolic of varied emotions an ordinary mortal goes through in life. In Karnataka, an item made of neem and jiggery called Bevu Bella is prepared partaken. The rituals and delicacies of Ugadi teach to maintain equanimity at every turn of life. Place: Across Karanataka, Telengana and Andhra Pradesh. The tiny lush green and hilly Manipur is one of the north-eastern states of India. The oval-shaped valley surrounded by blue-green hills has its own set of cultural fiesta in the form of festivals and events. A noteworthy festival is Cheiraoba, Manipur’s traditional New Year festival. The traditional New year festival is also known as Sajibu Nongma Panba, also called Meetei Cheiraoba or Sajibu Cheiraoba. Sajibu means the first month of the year (April) and Nongma means the first date of the month. This New Year festival is predominantly observed by a Meitei race, a majority ethnic group of Manipur. Preparation for the sacred occasion like cleaning houses, household items, buying new clothes is done in advance. The day starts early with a ritualistic offering of fruits, vegetables, rice and other uncooked items to Goddess Meitei Lainingthou Sanamahi. 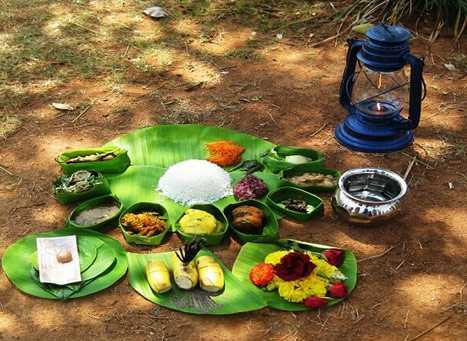 Various dishes are prepared from the items offered to Goddess mainly by male members of the household. The ready dishes are then offered to deities and then an exchange of dishes amongst relatives and friends take place. The final activity before sunset is climbing up the hillock to say prayers to the hill deity. A sort of fair, with shops, eateries, goes on along the road to the revered hilltop. Sindhis observed the first day of the month of Chaitra as Sindh New year. This traditional New Year festival is popularly known as Chendi chand which translates to the moon of Chaitra. Sindh community believes that on this auspicious day Bhagwan Jhulelal, an incarnation of Lord Varun Deb was born. Bhagwan Jhulelal has been the harbinger of brotherhood and good thoughts. Many Hindu people of migrated to India from the Sindh province of Pakistan. It is these communities who have kept alive the tradition of Chendi chand. Bhagwan Jhulelal is worshipped in various other names like Udherolal, Ghodewara, Jhindpar, Lalswaoin, Pallewaro, Jyotinwaro, Amarlal. As Bhagwan Jhulelal is an incarnation of Varun Deb, who represents water and fire, Sindhis follow a unique ritual of constructing a wooden temple in his respect. They keep a potful of water, flowers, fruits, and sweets in this temple and lit a lamp. Vahi rana sahib. On the day of Chendi Chand, Sindhi people carry this wooden temple on head and heads to the nearby temple to worship Lord Varun Deb. The place reverberates with traditional song and dance performances. 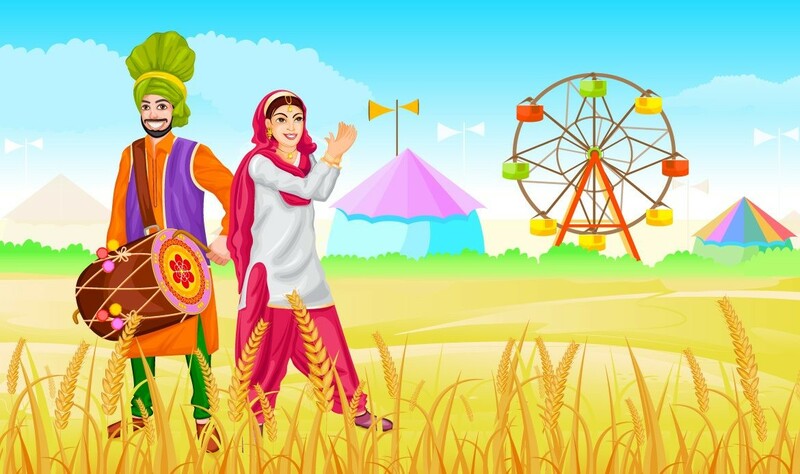 Baisakhi is the traditional Punjabi New Year celebrated with much gaiety and fanfare throughout Punjab. The holy day is ascertained as per Nanaksahi or Sikh calendar and usually, it is the first day of the month of Baisakh. This is the harvesting season of Rabi crops and people take this festival as a thanksgiving occasion to almighty. As per historical facts, in 1699 on this very auspicious day the tenth of Sikh guru, Guru Gobind Singh founded Khalsa. The Baisakhi day sees Sikhs praying at Gurudwaras and preparing a community feast. Baisakhi in Amritsar -The area surrounding the Golden temple in Amritsar vibrates with a carnival-like atmosphere. Tourists to Amritsar would soak in the Baisakhi Fair here as they would be enthralled with the Bhangra dance event, folk songs, local food, and handicraft stalls. It is usually celebrated by Kashmiri pundits on the month of Chaitra. On the previous night of Nav-Reh, householders place some raw rice, chapatti, a cup of curd, a pinch of salt, sweets, almonds, a silver coin, pen, mirror, flowers( marigold, rose, jasmine) and new calendar on a bronze plate. On the day of Nav-Reh or Kashmiri New Year, all members of the family woke up early and see the plate full of items arranged the previous night. Mahabisuba Sankranti or Pana Sankranti is considered as the Odia New Year as per Odisha calendar. The day falls on 13/14 April every year. The occasion marks the end of spring and commencement of summer. So a special delicacy Chatua and Bel Pana is prepared and offered to various Gods and at temples too. One could see a unique custom of hanging a clay pot (with a tiny hole underneath) over sacred Tulasi shrub. The pot is kept filled with Bel pana. The pot is called ‘ Basantara Teki’ in the local language. Jhamu jatra starts at various Shakti pithas on this day and goes on for a month. 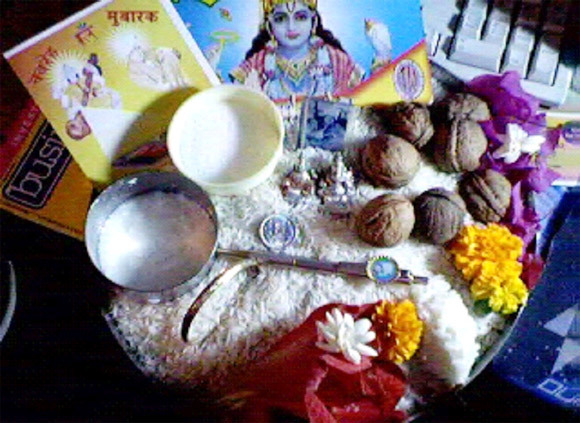 Jude sithal is celebrated in Mithila Pradesh of Bihar state. Maithili New year is also observed by inhabitants of Mithila in Nepal. It generally falls on 14th April and is also called as Nirayan Mesa sankranti or tirhuta new year. This day has been declared as a public holiday since 2001 after popular demand. The first day of the Baisakh month as per the lunisolar Bengali calendar (Bonggabdo or Bangla Shon) is observed as Poihilo Baisakh in West Bengal. People clean their house hangs festoons of mango leaves at the doorstep and on an auspicious day greet each other ‘Subho Nabobarsho’ and engage in worshipping Goddess Laksmi and Lord Ganesha. Special delicacies prepared on the occasion are Bhapa Doi, Shukto, Dhokar Dalna (curry of steamed lentil cakes), Patishapta (sweet crepe filled with jaggery), Malpuas, Rosogollas etc. 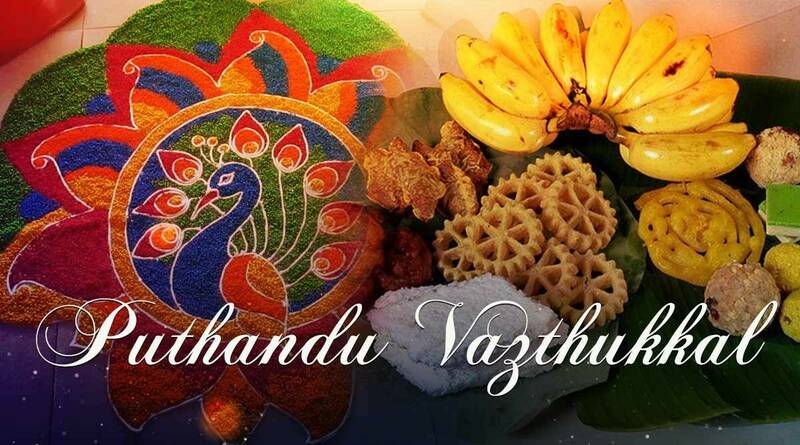 This is known as Tamil New year of Puthurusam. The day falls on the first day of Tamil month Chidhirai and it is usually 13/ 14 of April. Neighboring Puducherry also observes this day as New Year. Tamilians greet each other ‘Puthanantu baltukhala’. As with other New Year in various other states in Tamil Nadu people clean houses, take bath early in the morning, wear new clothes, visit temples and worship God with the plateful of flowers, fruits and other things considered auspicious for the occasion. Eye-catching colourful patterns of Rangoli are drawn at the entrance of the house to welcome New Year. Aval payassam, Thinnai payassam,Sago Payassam, Vishu Kanji etc are some delectable sweet dishes prepared on the occasion. In some part of southern Tamil Nadu, this festival is also known as Chittariya Bisu. The first day of Mesa month as per Malayalam calendar is considered the propitious day to celebrate Malayalam New Year. The revered deity of the day is Bisukkuni. On the previous evening of Vishu or Bisu, people keep rice, new clothes, cucumber, raw mango, betel leaves, betel nuts, jackfruit, mirror, gold flower on a bronze pot and lit a lamp near it. On the next morning, an elderly member of the family closes the eyes of members of the family and takes them one by one for ‘Kani’ Darshan or Bisukkuni darshan. After the ritualistic darshan, he gives ‘Kaitikam’ or a gift to each of the family members. A grand feast and firework display is organized for the occasion. New year festival in April is Beesu ( Shimla Hilla), Beesh(Kinnaur), Bisowa (Kangra) and Lishoo (Pangi-Chamba) in Himachal Pradesh. These versions of Baishaki (Punjab) have the theme of ushering in vitality, prosperity and preparation for the upcoming harvesting season. Whitewashing houses, shopping, preparation of delicacies goes on prior to the festival. People collect Brass flowers (rhododendron) and make festoons to be hung on their doorsteps. A bonfire named Jhalra, is the ceremonial burning of a bamboo basket (Kilta) on the Baisakhi day. Mask dances like Sih and Bura are performed. On the day of Bissu or Beesh, the Turi-Dhaki-Bajgi, the sects of scheduled castes) goes round of village wishing 'happy new year' to the beat of the drum. Thoda (archery) game, song and dance are other activities on this day. Special food items like Patanda(flour pancakes), Mittha(sweetened rice), Aktori ( a pancake made of buckwheat leaves and flour) is prepared and partaken as well as distributed amongst neighbours and friends. In a region like Suni eight days prior to Beeshu, clay images of Lord Shiva and Goddess Parvati(lahual) are made, decked up and divine marriage solemnized in the evening. Next day the images are immersed in river Sutlej. Ram Navami, is celebrated as per Hindu lunar calendar on the month of Chaitra( March/April). One of the most auspicious occasions for a devout Hindu, this day is observed on the ninth day of Shukla Paksha (bright half). As per mythology- Ramachandra, -elder son of Dasaratha(King of Ayodhya)- considered the ninth avatar of Lord Vishnu (One the God of Hindu Trinity) and the famous hero of highly revered text The “Ramayana”- was born of this day. The day is generally celebrated throughout India. Marked as an optional holiday, people take a dip in holy rivers, throng Ram temples in their locality, observe fast, listens to Ram Katha recitals. Homa or Havan (a ceremonial burning of oblation), charity, chariot processions, and Bhajan Samarohas marks the occasion. From the tourism perspective following places are a must visit to imbibe the essence of the religious occasion. Ayodhya (Uttar Pradesh)- A spectacular fair and grand procession marks the marvellous chariot occasion. Rameswaram(Tamil Nadu)-The place was significant as per mythology and religious texts, Lord Rama built a bridge to cross to Sri Lanka. On his way back from Sri Lanka, he also stopped here en route to Ayodhya and prayed Lord Shiva. In Khodanda Rama temple, Rameshwaram, Tamilnadu, Rama Navami is celebrated with all enthusiasm. Bhadrachalam, Telangana- The 17th-century temple Bhadrachalam temple dedicated to Lord Rama in Bhadrachalam on the banks of river Godavari is famous for Rama Navami celebrations. Sitamarhi (Bihar)- Renowned as the birth-place of Lord Rama’s consort Sita, Sitamarhi is also known for Janki Mandir that observes Rama Navami with utmost devotion. Shirdi, Maharashtra- Palanquin procession, Puja, Havan mark Rama navami celebratiosn at main Sai temple. 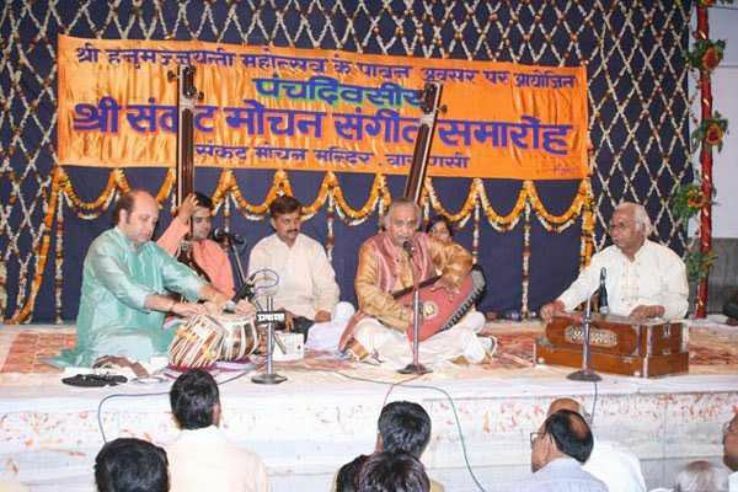 Sankat Mochan Sangeet Samaroha otherwise known as Sankat Mochan Music Festival is one such music live shows that are held inside the precincts of famous Sankat Mochan Temple in Holy Varanasi. An annual Music Extravaganza with live night concerts spans for 6 days. The event doesn’t charge an entry fee or any passes. The Music Festival is usually held in the month of April through the actual date varies. The date for the festival is scheduled as per Hindu lunar calendar and at times coincides with Hanuman Jayanti (14th April 2019). In 2018 it was held on 4th -9th April. The event has a nine-decade year (1923) old history and is said to have started by Goswami Tulsidas. Interestingly, artists offer their performances as an offering (Haazzari) to Lord Hanuman. Music lover visiting Vanarasi in April should make it a high point to visit the concert held on nights. They would be at bliss to see and hear India’s best Hindustani classical and folk artists under one roof. Famous names like Pt Jasraj, Pt Hari Prasad Chaurasia, Pt. Tarun Bhattacharya, Sivamani, Pandit Vishwa Mohan Bhatt, Anup Jalota, Pt Birju Maharaj, Ustad Amjad Ali Khan, Ustad Nishant Khan and Ustad Ghulam Ali(Pakistan) have given captivating live performances in these years. Dance performances by renowned danseuse like Sonal Man Singh, Surabhi Singh are other attractions. The Festival is named after Shiriu Lily, the state flower of Manipur. Festival is a state-sponsored annual Carnival held in Ukhrul in Ukhrul district. The festival aims to showcase the tourist potential of Ukhrul district. The 2nd edition of the festival was held on 24th -28th April 2019. A visitor to Manipur, in April/May/ June particularly to Shirui Kashung in Ukhrul district, would delight at the sight of the pinkish colour tubular Shiriu Lili flowers in full bloom. The peak bloom season is from 15th May-14th June. The state had been arranging Shirui Lily Festival to generate awareness about this rare seasonal flower found only on the upper reaches Shirui hill range. Culture enthusiasts would always love to get mingle with the Tangkhul tribes, a naga ethnic group of Ukhrul on the Indo-Burmese border and immerse in their traditional festivals like Luira, Mangkhap, Thisham. Cultural shows (folk songs, (Gospel song (Vareshi Laa), Lungchan Laa,) traditional dances), live music concerts, exhibitions, beauty pageants, and indigenous games and sports competitions like Shirui Lily Grand Prix are organized during the gala. Rich wildlife on the hilly terrains of Ukhrul, serene cool ambience, Kangkhui lime caves, Longpi village( famous black pottery craft), Shirui range ( ideal for trekking) is other magnetic factors for a keen adventurer. A major tribal festival of Gujarat, Chitra Vichitra Fair is held in Gunbhakari village in Khed Brahma taluka in Sabarkantha district on the rims of neighbour Rajasthan. The annual event is usually organized on March/April in ‘Amavasya’ (no-moon night), or eve of the new moon, after 15 days from Holy. The festival is synchronous with harvesting season of the wheat crop at the foothills of the Aravalli Mountains. An interesting folk tale surrounds the naming of the Fair as Chitra-Vichitra. It’s said Chitra and Vichitra are sons of King Santanu and stepbrother of Bhisma (Mahabharata). They once harboured on the region of Aravalli to be cured of certain diseases. A large gathering of 60,000-70,000 tribal groups the Fair is a very colourful celebration of traditions, costumes and ornaments, music and musical instruments, dances, handicraft items and of course tribal cuisines. Chitra Vichitra is a must-visit for anyone planning a holiday to Gujarat in March/April.